So I’ve had a pretty tough week, and am generally quite scared to be telling the world this, as I tend to just keep everything bottled up and it well and truly popped its cork the other day. So please be kind, as I’m not sure about this. I’m finding this whole graduate life pretty tough. We all get spat out the education system, without actually having much knowledge about the real world in my opinion, I got a 1st but don’t feel I actually know a lot haha! I’m not getting anywhere with job applications which is truly depressing, and I’m getting tired of having no routine. I’d like to think I’m good with change, but this whole transition period is not cool! Moaning aside, (apologies for being so negative) I know something will come along which is meant to be for me. I decided I needed a bit of time away to clear my head, so booked some train tickets to Nottingham to see my partner in crime Daisy, who I will totally design a Nutella based recipe for soon. Watch this space Daisy. This girl is the one person that can relate to me and I’m sure she is pretty bored of my moaning, so I’m sorry for that haha but you’ll just have to put up with me. We are filling the weekend with what we do best, eating. Pancakes & bacon will be in order, along with a green smoothie, and then the hard choice of where to go for dinner, topped of with some cocktails. Sunday we are going to a food festival at Wollaton, seeing people like John Waite, Lisa Faulkner & Sat Baines, I’m excited about this and will keep you all posted about my adventure! Hopefully this will be a well needed trip away to smile again! Sadly, I didn’t get the job at Sipsmith, but I know I’m not the right person for the job, and they enjoyed my application so onto the next one, its all about learning and interview experience (right?!). I’m trying to stay positive, which is quite ironic as its currently pouring with rain, haha! Enough of that, here is my recipe for vanilla and mascarpone pannacotta with a summer berry compote. Is it obvious that I love mascarpone yet? I could literally eat the stuff out the tub with a spoon. The smooth creamy mix complements the sharp/sweet berries so well and the deep purple colour contrasts with the pillowy white pannacotta. I used a mix of blackcurrants, raspberries, red currants and gooseberries, but it was a punnet of mixed berries which came in our Abel & Cole box, so frozen summer fruits would work well! Simply use whatever you have – be it strawberries, blueberries or raspberries, just experiment! 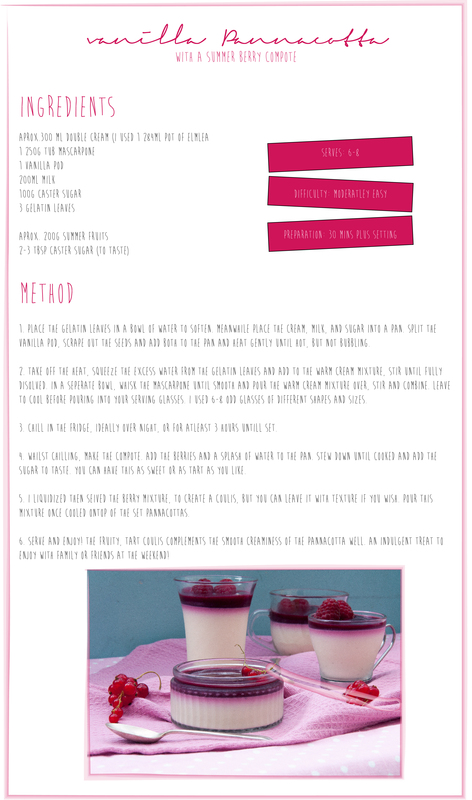 I designed another recipe card, not as pleased with this one but I will keep working on them, I am really trying to push and challenge myself with this blog, and am loving it so far. A lovely rich, smooth and creamy dessert, perfect to enjoy with friends at the weekend, or enjoy indulgently on your own, remember that there are no calories at the weekend (tiny fib)! Next week a slightly healthier recipe, a broccoli, lemon and chilli pasta recipe designed with my lovely friend Sarah in mind, This ones for you. I am starting to get a handle on my job lists, after having parties and a trip to the Isle of Wight. I see a lot of you liked my Amaretto Gelato post last week, and next week I’ll have another alcoholic ice for you adults to enjoy (sorry kids!) but here’s a recipe you can all enjoy… a beautiful berry tart, perfect for using our beautiful British berries, that you may have picked yourself, with children or bought from the market or supermarket. This weekend just gone, after getting back from a completely over indulgent trip to the Isle of Wight (what Grandma’s do best) I threw a small Barbecue to celebrate my sisters results from University. She got a 2.1 and I am so so proud of her, as along with studying, she worked full time, kept up a flat, found time for the gym and socialising with friends. There was about 10 of us, and we had a BBQ with the usual stuff, and then this tart, the biggest trifle you’ve probably ever seen and a surprise peanut butter and chocolate cake, which would have remained secret had my sister not gone in the garage! I had an amazing time with friends, food and drinks and we were also spoilt rotten. We each received a beautiful bunch of flowers, a Links of London Graduation charm, a Spa Weekend and £100. Thanks Mum & Dad! I may post up the recipe for the cake soon! 1. Start by making the pastry. In a food processor (or by hand)blitz/rub together the flour and fats until breadcrumb consistency, then add the water until a dough forms, you may not need all the water, likewise you may need a little more, I’ll leave this up to you! Once combined, tip on to a surface, form a ball, flatten and wrap in clingfilm and leave to rest and chill. 2. Once chilled, roll out the pastry. Lightly flour the rolling pin and surface and roll out the pastry to a few mm thick. You want it as thin as you can make it, for a nice crisp result. I used an oblong tin, but a round one is fine. Roll the pastry onto the rolling pin and place carefully in your flan tin. Press the pastry into the edges using a wooden spoon handle, or your fingers being careful not to rip your base. Don’t worry if you do, just patch it up with some spare pastry. With any left over trimmings, you can make some mini jam tarts, or tartlet shells to fill with left over custard. Place the flan tin back in the fridge to relax, while you make the custard and remember not to trim the pastry right to the edge as otherwise it will shrink back. 3. To make the custard, place the milk, and split vanilla pod (scraping out all the lovely seeds) in a saucepan and bring to a gentle boil. In another bowl whisk together the eggs, sugar and cornflour until smooth and creamy. Once the milk has come to the boil, leave to infuse for ten minutes. 4. Brink the milk back up to the boil, then whisk into the egg mixture. Return back to the saucepan and whisk continually until boiling, and really thick. Then add the diced butter and whisk in until melted and smooth. Place in a bowl, and top the surface with clingfilm (ensuring its in contact) to stop a film forming. Leave to cool then refrigerate. 5. While the custard is chilling, preheat the oven to 180c fan/200c, fill the pastry case with parchment, and baking beans/rice/pulses and blind bake for 10-15 minutes. After this time remove the paper & beans and trim down your pastry if you so wish. Return to the oven and bake for another ten or so minutes until the pastry is nice and golden. Leave to cool. 6. When ready to assemble, mix half the custard with the mascarpone, you may want to use an electric whisk to get a really smooth consistency or just use some muscle and burn the extra calories. Spoon in the tart and smooth evenly over the pastry – don’t worry about this looking neat as you are going to pile it with berries. 7. Add your berries, I chopped the strawberries in halves and quarters for the bottom and added the raspberries and blueberries! This creative bit is up to you! Which is why I love to cook. Make it your own! Keep your eyes peeled for next weeks post, a refreshing G&T sorbet! Time for me to go back to the job hunt! Wish me luck!